"He thinks of himself as a bit of a Peter Pan," says 90-year-old table tennis competitor Les D'Arcy's daughter, "He doesn't think of himself as getting old." "Patients with dementia need a lot of light, because darkness provokes fear." As she speaks, 90-year-old Inge Hermann makes her way through a very well lit hallway in the facility where she lives in North Germany. She's moved here, she explains, because "I got an illness in my brain and could not think clearly anymore." She was unable to eat, she was confused: "I would got to the bakery at 11 at night and be angry that it was closed." Inge isn't angry anymore. At the facility, she discovered table tennis, and with that, a new focus for both her mind and body, a new kind of light and a remarkable energy. Now she walks the hallways with purpose, her coat billowing her as the camera in the documentary Ping Pong follows along behind her. "We have hundreds of nerves in our brain that are not used," she explains, while you watch her fellow facility dwellers scoot about on wheelchairs or ease themselves into a standing position. "If you train at using them, they can do the job of broken parts of the brain." Inge is so unbroken now that she's headed to the Over 80 World Table Tennis Championships in China's Inner Mongolia. It's her first time, but she's surrounded by players who've attended many times, including several other subjects in Hugh Hartford and Anson Hartford's film, edited from 80 to 60 minutes for its premiere as part of PBS' POV series on 9 September, and available online from 10-14 September. Every part of the tournament is brightly lit, from the city streets to the stadium, built for the 2008 Olympics and now filled with dozens of competition tables. The film offers glimpses of the opening and closing ceremonies, the flags and choreography that frame the proceedings, as well as the television reporters who crowd the floor, eager to interview the contestants from all over the world. But its own focus is more intimate, following the experiences of Inge, Ursula Bihl, a German soldier's widow, the UK's Les D'Arcy and his doubles partner Terry Donlon, also from the UK, as well as 88-year-old Lisa Modlich, referred to by one opponent as "The American from Vienna, the one wit the hair." 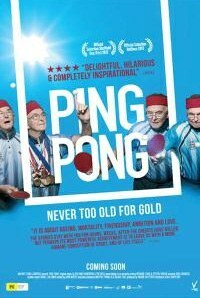 Each player is initially identified by home location and age, and ach contributes to the film's larger project, which is to suggest the various efforts and considerable pleasures of ping pong. These players tell their stories in interviews, of course, enhanced by comments by their appreciative family members, in their kitchens and living rooms. The defending world champion, Urulsa is accompanied o n her trip to China by her son Gerhard, an exceeding amiable-seeming fellow with a beard, smiling and urging her on from the sidelines. Introduced as she's kneading bread in her Stuttgart apartment, she says she doesn't "prepare" for a world championship, only arrives at the site ready to go. She congratulates Inge at the tournament, for her fine play, though she's a bit put off by Lisa's comment concerning her son: "She told Gerhard, 'Your mother gave you the wrong milk as a child, that's why our so fat.' Gerhard was so angry." Ursula, however, seems mostly unperturbed, like her fellow competitors finding joy in the opportunity to travel and play. Once a bodybuilder, Les today maintains a routine, lifting weights and showing off his shirtless chest for the Hartfords' camera. Asked how he prepares for table tennis, he pints to his head: "These are the muscles you use." His daughter confirms, "He thinks of himself as a bit of a Peter Pan. He doesn't think of himself as getting old." Similarly, Les' partner Terry observes, "I want to keep playing as long as I can, because I don't want to sit down and I don't want to die." Terry's story opens with a shot of him in a hospital bed, before it cuts back to "six months earlier," that is, the time of the tournament." He's diagnosed with cancer, and while he struggles to breathe and even stand, he continues to play, his proud and devoted wife at his side, pleased when they watch video recordings of his previous matches, when he was relatively young and dark-haired. "You have all the same mannerisms now as you had then," she smiles, sure that keeping up with the game will benefit his health, and moreover, that they'll be at another tournament some day soon. It's not always clear whether table tennis is a means to longevity or a sign of it. Warm and gently observational, Ping Pong follows its subjects' leads, by way of consistently lovely camerawork, long tracking shots, wide images that show the thrill of the tournament, and close frames suggesting the intimacy shared by husbands and wives, children and parents, and competitors with one another. Everywhere they go, light surrounds them.